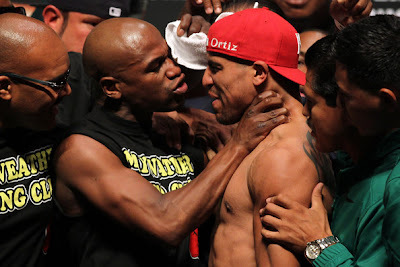 The whole world saw what the arrogant brat named Floyd Mayweather did to his young opponent, Victor Ortiz in their much awaited fight yesterday at the MGM Hotel and Casino at Las Vegas. To say that it was an unsportsmanlike act is I think an understatement. My kids saw it in disbelief. My wife, who hates boxing (but is only forced to watch it while waiting for the station breaks in between rounds for her to switch to her favorite Sunday noontime show) was aghast. Knocking out an unsuspecting, defenseless opponent who was still in a break mode following a gentleman's beso-beso was a treacherous act. And he says he's the best boxer in the world? Even in those days of the cowboys "high noon" shoot-outs, all was fair. They count out their steps and draw fire at the designated moment. The boxing crowd booed the decision by veteran referee Joe Cortez. Their message was clear. It was not a knockout. It was a no contest. Joe Cortez should be sanctioned. He messed it up. How could he say it's a "go" already when he was clearly not looking at the boxers and was even heard talking to someone else? Normally, referees should be at the center and signal the boxers to start by saying "box". Blame him for that. The post fight interview further revealed Mayweather's persona. He was rude and got irked when Larry Merchant, the respected grand old man of HBO who's been in boxing long before Mayweather was even born, kept on asking himof the circumstance. He was guilty and the whole world saw how disrespectful he was. I have no love lost for Mayweather. His personal life is a mess. He batters his wife and he is always hailed to court for other misdeeds. Ok, it's his personal life; his boxing is another thing. But he's scared of our idol, Pacquiao, making all excuses in the world just to evade the much awaited fight. Much more, that drug accusation is simply slanderous.That's why, he's not a great boxer. A great boxer should fight the best; that's the only way to prove who you are. Ali fought Frazier three times. Sugar Ray Leonard, Marvin Hagler, Thomas Hearns, Roberto Duran, all great fighters, Hall of Famers. They fought one another. And the boxing world knew what stuff they were made of. They lost at one time or another but they still were hailed as great boxers. That's why Pacman is great. Not only did he fought and demolished all those best boxers in several weight divisions he could reach, he wants to fight Mayweather to settle the score once and for all. My wife says how could I enjoy the brutal world of boxing. But boxing is art. Boxing can be fought by true sportsmen. Boxing is a sport of men;men of honor, dignity, courage, respect, discipline. The one we saw yesterday was not the boxing I love. I can't wait that day when Pacquiao demolish and crush that brat ego tripping Floyd "The Foul" Mayweather. Boxing is a sport of men;men of honor, dignity, courage, respect, discipline. The one we saw yesterday was not the boxing I love.